Vlogger Kiara Di Paola records a video at the Pint Shop. "My name is Maraschino Marcus, and I'm going to be one of your flavor experts today!" says a tall and chipper man dressed in a pink lab coat, standing in an all-pink room. He's about to teach a group of women about "our megastar flavor," vanilla, an ingredient he says "is essential to almost all of the flavors that we know and love." 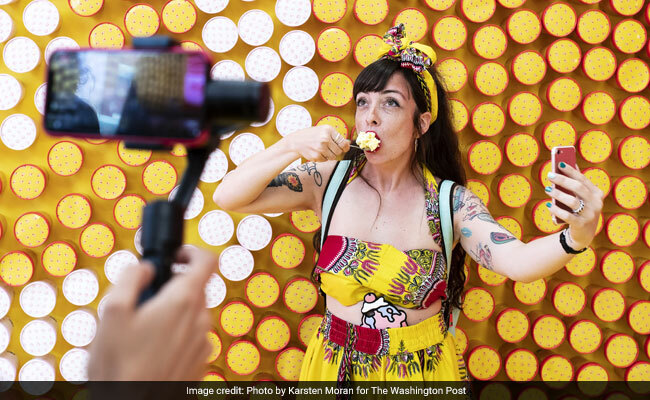 Welcome to the Pint Shop, a spinoff of the hugely Instagram-popular Museum of Ice Cream, which immerses visitors in a world of photo ops with rainbow sprinkles and gummy bears. Now in San Francisco, the museum got its start in New York - and in June, it returned as a spinoff concept, selling the museum's new line of ice creams. The museum started as a photo-heavy attraction, but the Pint Shop marked a greater transition: The Museum of Ice Cream is no longer just a place, it's a lifestyle brand. And that's just the beginning of founder Maryellis Bunn's grander ambitions. Maraschino Marcus, who is now joined by his peppy, female companion Nilla Bean, tells the group they need ice cream names (Bunn's is "Scream"). The group's members give themselves names like Mocha and Salted Caramel. No one chooses Carageenan, an emulsifier often found in ice cream, or Soy Lecithin. The Pint Shop is no place for snark. Rather, it was designed to give guests "a very tiny snapshot into the experience that I and my team had actually developing an ice cream line," said Bunn, 26. "What does this flavor look like, what does it feel like, what does it smell like? And how does it feel to be inside of that flavor?" It looks like rainbows, smells like sugar and feels like money. According to MarketWatch, the Museum of Ice Cream has made more than $20 million since its opening in 2016. Tickets to the museum in San Francisco sell for $38 apiece, but the Pint Shop, a pop-up that closes Aug. 19, is free. It found a corporate sponsor, Target, where the ice creams are also sold, and the store looks like a colorful riff on a big box store: monochromatic aisles of merch in the museum's signature pastels, a freezer aisle full of branded ice cream, three shed-sized pints decorated to be backdrops for social media snapshots. And, in the back, the pink room for the tasting experience, which costs $33 and includes a pint. It's all designed to look great in photos. Jump in the Cherrylicious pint and make GIFs of yourself swimming through a pool of plastic cherries. Pose in pink in front of the aisle of pink sprinkle toys and accessories. "I actually brought three dresses," said Saina Kam, a luxury fashion marketer, wearing a blue slip dress that perfectly matched the branded color of the Churro Churro flavor, which encompassed an entire aisle of the shop. "We're going to have an outfit change later." Bunn has said in previous interviews that her goal is to become the next Walt Disney. But she actually wants to build a city. "We need spaces that . . . catapult our human behavior interaction in a way that we haven't seen before," she says. "We've become dormant in our curiosity and creativity. So if I can build spaces - cities, right - that really reinvigorate that, so it's not just this check in, go to work, go home." She deflects questions on what that city would look like or how it would function. But every space - the hospitals, stores, parks - would be designed to foster creativity and connection. Would it be a utopia? Or - consider the image of a charismatic leader surrounded by pink-clothed employees, like in the recent Netflix documentary series "Wild Wild Country" - would it be a cult? "Utopia has this connotation" that is easily misconstrued, she said. "I think about it more in the sense of like, how do we build the spaces that are going to change the way in which humans think about culture?" Either way: In her future city, the grocery stores would not look like the Pint Shop. "It's not a grocery store," she said. It's a space that "spoke to our brand mission of inclusivity." Art critic Ben Davis has written that Bunn and her imitators, like San Francisco's Color Factory - and serious art museums that host room-size installations like the National Building Museum's "Fun House" - are part of a movement called "Big Fun Art." "Branded experiences . . . compete with retail spaces looking to refashion themselves as 'experiences' to get some advantage over online shopping," Davis wrote. "These in turn compete with the various new para-art pop-ups that now go head to head with museums for the adult theme-park dollar." While Bunn is not sure she started an art movement, she knows she is an artist. "My art is human experience," she said. And human experience is the art that other people make in her spaces: "Before they go, they're curating a group of friends they want to go with," she said. "They curate their own outfits because they want their outfits to be part of it, so that's where the creative process starts to flow." Millennials don't want things - they want experiences. That's the line marketers and trendspotters have been trumpeting for years. Things are almost shameful, something we've Marie Kondoed out of our lives. Experiences are pure. But a photo of yourself experiencing something - even if it only exists as pixels on your phone - is a thing, a thing that people want. It's a thing they'll pay extravagantly for. People who go to the Pint Shop aren't just there to buy ice cream. They're there to take photos, hundreds of them, "curated," as Bunn says, with outfits and poses and objects, to become social media status symbols. Bunn has wavered about that idea publicly, sometimes encouraging people to put away their phones. "We're in the process of a new MOIC project I'm building. There will be spaces which will be phoneless," Bunn said. "I think we'll get some backlash, but once they allow themselves to let go it will be powerful." But selfies, as much as ice cream, are what she's selling. The children's clothing line she launched in another partnership with Target, Art Class, matches the exhibitions exactly: For the perfect photo op, put your child in a banana-print shirt on a swing in front of a backdrop of bananas. People use the Pint Shop merchandise as props, often without buying. But that's okay, because their photos serve as advertisements for $14 water bottles that look like milkshakes, or $22 sprinkle-print yoga mats. Experiences are commodities, and that's been the undercurrent of these social media-focused museums since they began. The Pint Shop just makes the implicit overt. The experience is a store. But all of these experiences were stores all along. Back at the tasting room, everyone is told to grab a millennial-pink lab coat. "Uh, I'm okay," says a chic-looking girl in all black. Her outfit is a look, and a pink lab coat is not her aesthetic. Maraschino Marcus tells her that the lab coats are not optional. "It can get a little messy" is his reasoning, but one suspects it's because photos look better when everyone in the pink room is wearing pink. We're invited to crowd around an assortment of beakers full of marshmallowy cotton balls and waft their scents toward our noses, high school chemistry lab-style, before experimenting with test tubes and eye droppers of vanilla extract and cream to create an ice cream base. "We went through 7,000 variations to come up with ice cream bases that you're going to taste today," Maraschino Marcus says. "Over the last year: 7,000!" Finally, the ice cream arrives. More lab-coated assistants dispense scoops of six flavors - with names like Vanillionaire, Nana Banana and Chocolate Crush - into a custom dish. The scoops are the size of a ping-pong ball: Two bites and they're gone. The ice cream is good, but not remarkably better than any other brand of premium grocery store ice cream, like Haagen Dazs. The photos, however, are incredible.